Evolved gas analysis (EGA) from thermal analyzers significantly improves the value of Thermogravimetry (TG) experiments as the identification of gases evolved from a sample helps in better interpretation of mass loss steps and allows to draw conclusions about a sample’s chemical composition. One possibility established for EGA is the coupling of Fourier transform-infrared spectroscopy (FT-IR) to thermogravimetry instruments (thermal analyzers). The FT-IR is a sensitive and a highly selective technique, particularly for organic molecules. This method is capable of detecting the infrared absorbance of molecules owing to their vibrational mode and hence is widely used for studying biomass samples or decomposition of polymers. When ceramic and inorganic samples are heated, they release several gases such as CO2, H2O, NH3, or SO2 which can be detected and differentiated through their unique infrared spectra. In turn, ceramic fillers in composite samples influence the flame retardancy and other properties of polymers which can also be investigated using FT-IR coupled thermal analysis systems. The term ‘Simultaneous thermal analysis’ (STA) applies to the concurrent measurement of TG and Differential Scanning Calorimetry (DSC) on the same sample in the same device. Caloric effects are shown by the DSC signal due to mass gain or mass loss of a sample as well as due to structural phase transformations which are not related to mass changes. STA instruments are efficient, flexible and provide a broad temperature range from -150 to 2,4000C. Also, unlike TG instruments, a STA instrument offers the possibility of measuring samples with larger mass and volume. The coupling interface between FT-IR and TG or STA instruments typically includes heated adapters and a flexible, heated transfer line. Heating of the coupling interface is important to prevent condensation of released gases. While integrated software solutions are available, the transfer line coupling can be considered as a connection of two separate instruments. However, the transfer line has some drawbacks as it slightly delays the release and detection of evolved gases. In this experiment, a direct coupling between FT-IR and STA instruments is presented. The FT-IR spectrometer is mounted on top of the STA furnace, providing a compact and completely integrated STA-FT-IR coupling system. Besides the possibilities and the value of STA-FT-IR measurements, the benefits of the direct coupling with respect to transfer line coupling are illustrated. Quantification of the evolved gases is also discussed based on the measurements on CaCO3 where the calibration of FT-IR signals for CO2 was also based on pulse thermal analysis (PulseTA). Figure 1. NETZSCH Perseus STA 449: the Bruker type ‘‘alpha’’ FT-IR spectrometer coupled directly to an STA 449 Jupiter simultaneous thermal analyzer fitted with an optional automatic sample changer. Bruker‘s "alpha" FT-IR spectrometer is placed directly on top of the furnace of a NETZSCH STA 449 Jupiter so that the distance between the gas cell of the FT-IR spectrometer and the sample is just 25 cm. Since the connection tube between the gas cell of the FT-IR spectrometer and the furnace is also heated, condensation of evolved gases is reduced. Now, both FT-IR and STA instruments can be separated or coupled easily. 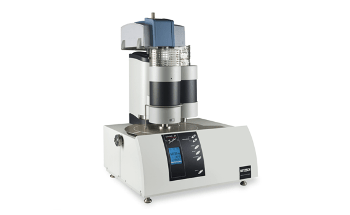 The Perseus STA 449 system has a vacuum tight design which proves useful for evolved gas analysis. For a comparison, most of the samples were determined by employing the traditional transfer line coupling method, as shown in figure 2. Figure 2. Interface of direct FT-IR coupling NETZSCH Perseus STA 449 (top) compared to coupling with a (flexible) transfer line. The FT-IR gas cell of the FT-IR spectrometer ''alpha'' includes single ZnSe windows at both ends which limit the spectral range of operation between about 500 and 6,000 cm-1. Heating of the gas cell is controlled via software at approximately 200°C temperature. The FT-IR’s detector, which is of deuterated triglycine sulfate type, operates at spectrometer temperature and hence eliminates the need for liquid nitrogen. In this study, TG-DSC and TG sample carriers with thermocouples type S and a PtRh furnace were applied. STA measurements were performed by means of PtRh or alumina crucibles. All STA results are baseline-corrected which indicates that empty-run signals were deducted. Then, FT-IR acquisition was performed at a resolution of 4 cm- and 16 scans were averaged for a single FT-IR spectrum where one scan took approximately 1 s. Only the CaCO3 sample was determined using just four scans per spectrum. Using pulse thermal analysis (NETZSCH PulseTA), quantification of evolved gases was also investigated. This instrument helps in injecting defined volumes of calibration gas into a thermal analyzer, thus leading to a calibration for this gas. In order to study the difference between the STA-FT-IR coupling and direct STA-FT-IR coupling, different samples from the fields of inorganics, organics and ceramics were measured utilizing a heated transfer line. Other measurement conditions, such as sample mass, heating rate and crucible were selected as identical as possible. It was observed that most of the samples provided similar results and no major difference was found between transfer line and direct coupling. Overall, a significantly better correlation between the infrared absorbance and the mass loss was observed, and different kinds of evolved gases could be detected through their FT-IR spectra. This application brief has presented a new, direct coupling of an STA instrument and an FT-IR spectrometer without a transfer line. Different samples from the field of inorganics and organics were measured to show the benefits of the direct STA-FT-IR coupling over state-of-the-art STA-FT-IR coupling. On the other hand, most samples provided similar results and it was observed that the time delay caused by the volume of the transfer line itself is negligible. A good correlation between evolved gases and detected mass loss steps was demonstrated, along with the possibility of identifying evolved gases through library search. In case of highly condensable decomposition gases, the direct Perseus coupling proved advantageous over the transfer line coupling technique.